TheMikeDuBose is the pen/stage name of one Mike S. DuBose. Clever, huh? 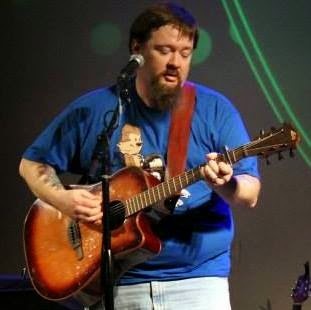 Mike is a singer-songwriter out of Northwest Ohio who writes songs about alcohol, depression, and other fun topics. His debut album Skeleton Coast is available as a pay-what-you-want download at Bandcamp. He's also on all the standard online social sites. In addition to playing his own stuff, Mike is also an experienced musician. As a kid, he was classically trained on violin but gave it up because it was hard to play AC/DC on the thing. He has played very heavily distorted guitar in several very loud bands (see Other Endeavors for samples) and currently plays banjo in Midwest Tourist. He is also open to other noise-making possibilities. But he is about more than just music! Mike is a father, a husband, a clinically depressed mentally ill guy, a pretty decent cook, an amateur photographer, a college teacher, a Doctor of Philosophy, a former Media Studies scholar (widely published but still a failure), a former pizza place co-manager, a nerd, a snappy dresser, a social outcast, a published (one time) poet, a new vegetarian, and a science fiction fan. He was also on a radio show once. Despite this varied resume, Mike has never really hit the big time or achieved fame...or even infamy, for that matter.